Ang Inyong Lingkod: Fernando O. Abeto Sr.
Fernando Oliva Abeto Sr. (aka “Ka Ronnie”) was born on May 31, 1959 in Tabon (Talim Island) Binangonan, Rizal Philippines to parents Mr. Francisco M. Abeto and Mrs. Ciriaca O. Abeto. Ka Ronnie wed Mercedita “Chie” P. Abeto (born March 9, 1968) and the couple were blessed with 3 sons and 2 daughters. Ka Ronnie works as a Project Services Coordinator in Snamprogetti Saudi Arabia Ltd. from 1995 to the present. “He is the beau ideal of an advocate who applies servant leadership. He leads his team by example and he always gives great emphasis on Transparency, Accountability and Good Governance. He is very effective on the ground (in) helping the distressed OFWs out of their problems and he is also visible in the cyberspace, giving persuasive views on many important issues. That makes Ka Ronnie a unique leader, a real public servant!” – Tas Espiritu on Ka Ronnie. “Ronnie is my officemate when we started our career with Snamprogetti in 1990 up to the present, we share the same room and the same office in 1990 to 1992 before he was absorbed by our Head office in Riyadh. His first service to the OFWs was the case of 5 employees of our company who were terminated by Snamprogetti in 1991. They were not reinstated back to their work but they received the payment of their unused portion of their contract and their vacation and end of service benefit were given alongwith a No objection Certificate. From then on until now, I saw how he share his time, his own resources to help distressed OFWs on personal level; he is not associated with any groups or organization but it does not prevent him from providing the needed assistance or to be in the forefront of every call to action on national issues such as OWWA, HSW issue and others” – [Cef Alvarez] on Ka Ronnie. He organized Namfrel Chapter in Saudi Arabia in 2004 elections that covers three major cities, Riyadh, Jeddah and Al-Khobar, a difficult task considering many factors such as the complexities of political situation in Saudi Arabia, its geographical vastness, logistics and limited resources. But he was able to tap respected and non-partisan groups like OFWCC in Jeddah, APORAA & PICPA in Riyadh and RISAL in Al-khobar. This is because of his ardent desire to protect the sanctity of the ballots and to ensure the success of Overseas Absentee Voting being one of the convenor of ICOFVR (Intenational Coalition for Overseas Filipino Voting Rights) who lobbied for the passage of the bill and despite of a very short notice to activate Namfrel in May 2007 election, he still was able to mobilize Namfrel volunteers to conduct quick count and represent in the canvassing of votes unmindful of his work location (he is based at present in Khurais desert for Aramco Gas & Oil Separation Plant project). Served as Namfrel School Chairman in 1986 snap election and the succeeding elections (1987 & 1989) until he left for Saudi Arabia in 1990. Duties mainly 1) supervision and coordination of the election activities in three public schools namely Bilibiran Elementary School, Pantok-Palangoy Elementary School and Darangan Elementary School; 2) Attend and witness the distribution by the Municipal Treasurer’s office of election paraphernalias to the BEIs (to control the quantity of ballots and allocation of other election paraphernalias to each precincts); sit as watcher in the canvassing in May 1995 election. Conduct training on pollwatching duties and responsibilities in May 1995 election. Training conducted in each barangays in Talim Island (total 12 barangays) and in the Liberal Party HQ & Fisherfolks (CALARIZ) HQ for mainland Binangonan. 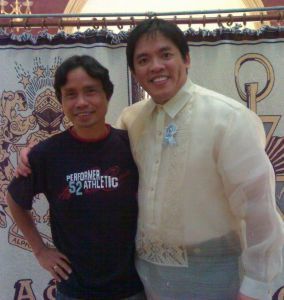 – Fernando Oliva Abeto Jr. was inducted to Anginyonglingkod in 2007.